The beauty of a white sand beach and crystal blue ocean water, that is of Manjuyod Sandbar’s is hugely at par with the all-time famous Maldives – an island country in the Indian Ocean, known for its breathtaking beach resorts, corals and rich marine life. 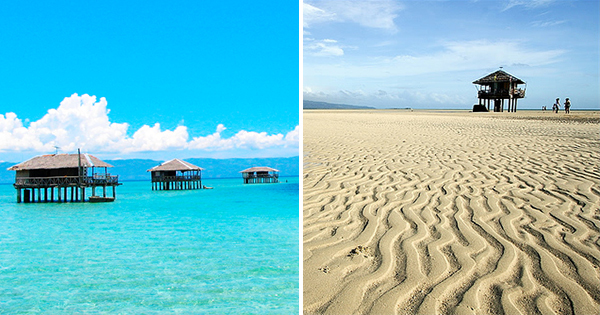 The former may be smaller in size – just a 7-kilometer stretch of virginal white sand, accessible through a 15-minute boat ride from Capinahan Wharf in the South Bais Bay, Bais City Negros Oriental -- but like the Maldives, Manjuyod Sandbar is known to appear and disappear depending on either a low-tide or high-tide. There are cottages built on stilts on Manjuyod Island if you and your group would love to stay overnight – just go ahead and bring your cooking utensils, ingredients and the like. Furthermore, tourists can catch a glimpse of whales and dolphins there, that is why it is a favorite stopover for group tours organized by the Bais City Tourism Council. This cool and superb island, also known as Sumapao Shoal, is actually a whopping 600-hectare piece of property that includes the submerged portion. Getting more popular these days, by the minute to due to its natural charm and wonder, Manjuyod Sandbar definitely has the potential to be one of the world’s best islands, given enough funding and improvement by our government. Fun and excitement are aplenty for all tourists at adorable Manjuyod Sandbar, because it showcases many a great activities to take advantage of, such as swimming, sunbathing, snorkeling, scuba diving, picnicking, or simply chilling with your spouse, family or travel buddies. Moreover, an organized tour package will also highlight a visit to the Bird Sanctuary and Mangrove Park at the end of the day, so get set with your cameras and just snap away! Advance booking is necessary for the motor boat to take you and your company to awesome Manjuyod Sandbar so call and inquire via Bais City Tourism Office telephone numbers, (035) – 541-5161/402 – 8174. Additionally, according to www.dumagueteinfo.com, in order to reach this spectacular island from Dumaguete City, you can board the jeepney at Dumaguete-Bais terminal near the port, and head on to Lo-oc Road in Rizal Boulevard. Otherwise, most conveniently rent a car or van by asking your hotel to arrange the land trip just for you.